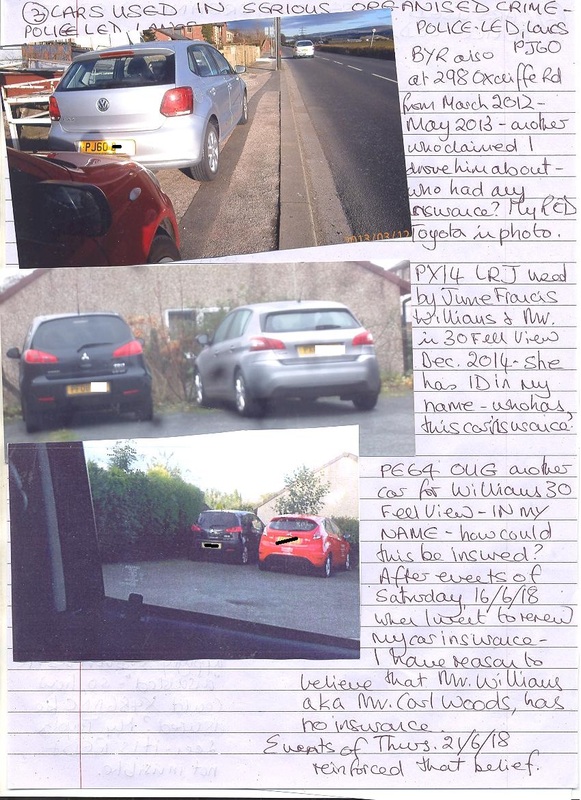 Received: more on the deliberately complicated ID frauds involving Carol Woods, together with the harassment she’s forced to endure every time she leaves her home – and, very often, when she doesn’t and is indoors at home where she is still attacked. They were throwing eggs at her car parked outside her home not so long ago…and stones at her window too, it has been reported. 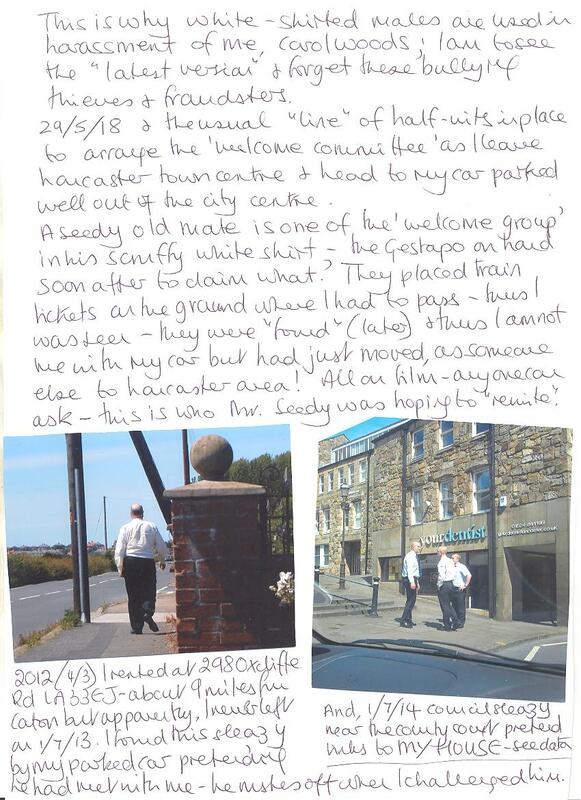 The past is reinvented over and over using numerous locations relevant to whatever, with lookalikes to Carol being used as best they can – the old women used’s hair is dyed to match Carol’s, they try and get them to wear similar clothes [an example of what’s happened here regarding the stalking experienced: a few months ago i ventured out, wearing a high-vis bright green waterproof jacket that security guards and similar wear – nothing special – these types of jacket are popular and commonplace and can be bought anywhere now, but as I stated before often oddballs would turn up at the location I would be going to, to just stand and stare at me, to simply harass me and let me know they’re there. On this particular day, arriving home, there was a young character standing outside my home – he my height + build etc, dressed identical to me – wearing a bright green high-vis jacket identical to mine. He was just standing there staring into space, but as I approached my street door from his “blind side” he turned and shouted at me "HELLO! ", whilst looking at me. He’s obviously been primed as to my approaching my home after getting off one of the regular buses that frequent the main road by me. I just thought “how sad” and went in. Fraudster at 298 Oxcliffe Rd LA3 3EJ and repeat car at 33 Fell View LA2 9RP. The first page of photos shows the white shirted fraudster found out in 2013 when I rented at 298 Oxcliffe Rd (as from 4/3/12). He was stood by my car parked on the roadside and pretending he had met with me, notice the folder he has; this is the FORGERY and pretence he has dealings with me as “official”. Blue shirted fraudsters are also used but white is “this week”, 2 yesterday a.m. and one the day before and all on photos. (My Krakow “holiday” saw more thuggery at my hotel with its Masonic links – BEST WESTERN – but they in the same types of cars but in the blue shirts and again, on photos. Aug 2008 and I knew little of the FRAUDS the thugs would stoop to and saw a silver Audi outside my house one day with others noticing, no one out or in and an old doxy just gawping, she drove off when I walked by and I found she was DAWN MORRIS of LYTHAM St ANNES thief, fraudster, liar and worse. That set the scene and is STILL done with Audis the most used. This one found out at my car in 2013 rushed off and I knew he would have a car somewhere, he was not a walker. 298 was quite isolated for the carless. He had hidden his car, a lime green 2 seater of which I took photos. FFWD to recent and 33 Fell View the unoccupied house used by council sleazy and others who ALL PRETEND that the former lone tenant MRS MARGARET PECK is STIIL THERE when she is MISSING. I have reported her as missing in suspicious circumstances lots of times as the COUNCIL STILL ADD HER TO THE ELECTORAL REGISTER. 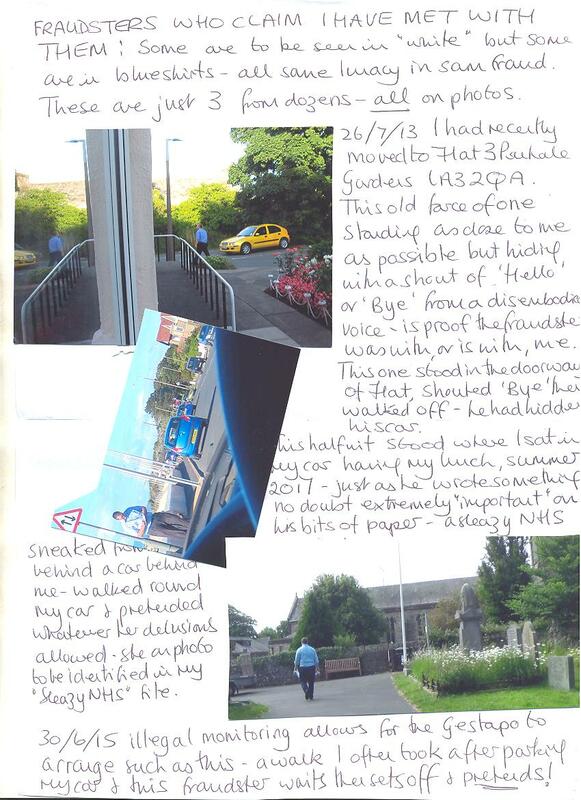 From my moving to rent 28 Fell View (24/3/14) it was obvious that FRAUDS were conducted from 33 and I found out the lowlife, all unemployed were using it to pretend they called on someone “disabled” to drive them about – it was ME in fact. Blue Badges were used in FRAUD and ALL reports ignored. From this spring, this sleazy female started to arrive and PRETEND to be a combination of the old fraudster found out in April 2013 and those who had used 33 earlier in frauds and pretence. MT03 PWL, a stalker of me found out, yet again they pretend I am the missing Mrs Peck from 33 and am “disabled” BUT 33 is not adapted for disabled. I have kept note of events at 33 and almost 5 times EVERY WEEK at night I go to check and NO ONE IS THERE except the occasional fraudster such as 4 nights Sept 2017 pretending he moved me after an RTA from Blackpool. Yet this sleazy is sent WITH KEYS, they clearly think the average tax payer is a cretin to accept this embezzlement of public monies. The driver of MT 03 is no advert for “a carer” and truly I would not want to have anything to do with her if I was Mrs M Peck which I am not which is why this sleazy is PAID to pretend with a Mrs Invisible. YOU FUND IT. But how can such drivel generated be anything to do with me if I have sent out nothing or signed nothing? The Gestapo watch what I wear (!!) and have others they think can be said to be me “seen posting”. Thus on 3/7/18 and I just back from harassment i.e. “holiday” and I walk to my car parked which the Gestapo know via the ADMITTED ILLEGAL GPS fitted 21/1/12. This woman waits to then walk to the old post office and waves about an A4 white envelope, it is addressed and stamped, she is to be ME “SEEN” posing. This is done OFTEN using lowlife round Fell View much of the time and the posties KNOW EXACTLY what goes on and they deliver recorded and special delivery IN MY NAME to others round Fell View who are used to be ME. How? The item is addressed to me but the Gestapo having sent it originally expect a response so they intercept my male and then add a large number of whichever thief and lowlife is to have the item. Thus is Jackson in 26 is the “me” of the time then a large 26 is written on the envelope so the postman knows it goes to 26. It might have 20, 22, 24, 30, 41, 45, 39, or even 33 the unoccupied, maybe that is why the sleazy calls, to pick up mail? Given that I apparently live in 24 houses at least in the Fell View and area then much is generated. I have heard and seen this and was told I was mentally ill “hearing things” but the bullying halfwits telling me that did not know what evidence I had/have. There are more photos showing GESTAPO aiding Jackson in 26 Fell View for example, 31 Dec 2014 and they using vehicles and a red taxi, at least, all to claim she was me and she posting was really my posting. Ends. Carol Woods please feel free to quote me. These latest updates received from Carol Woods are from 27 June up until today 05 July ’18. 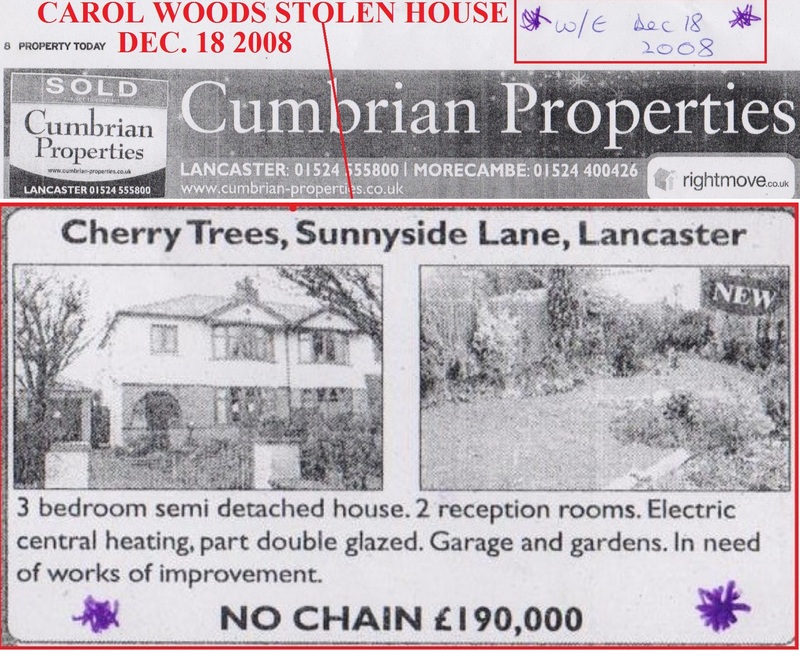 The first posts relate mainly to Carol’s stolen house, with an advert showing a pic of the house – the estate agent behind it denying all knowledge of anything to do with this entire matter, even changing the business’s name 3 times since the crimes began. The contents of the house were taken too – valuable antiques, and approx. £70,000 damage was done also to the building eg. stained glass windows, to name just one item. The few days trip to Poland Carol undertook was marred by daily stalking by the morons, shouting and hollering often to let her know their rancid presence was afoot, identical to the harassments during other short trips abroad Carol has endured, shown in the relevant updates at the time when the harassing continued as if it was still the UK., only with foreign accents. This time in Poland the morons wore blue shirts at times, en masse, like a little “uniform”, as described in the post/pics below “Harass UK citizen and why 28 June 2018″ – easy to spot, I guess, if one of them accidently fell off the side of a cliff from a great height, eh? What a great tragedy THAT would’nt be, eh?!.. After these latest updates, some background, including Carol’s original article detailing a major part of the whys + wherefores behind this severe targeting that’s lasted years “York LGO Blog re Lancashire CC” http://criticalreader2006.blogspot.ae/. Did someone somewhere in the Lancashire hierarchy invest a large amount of money in the doomed “supercasino”, and then lost it all when the project went pear-shaped, and the character’s still so heartbroken about losing his cash all these years later there’s no let up in the unspeakable targeting, which is condoned by his chums in every authority one can think of? Why did Gary Speed really pass away? Where are the missing old ladies – Sheila Bridges, for starters? 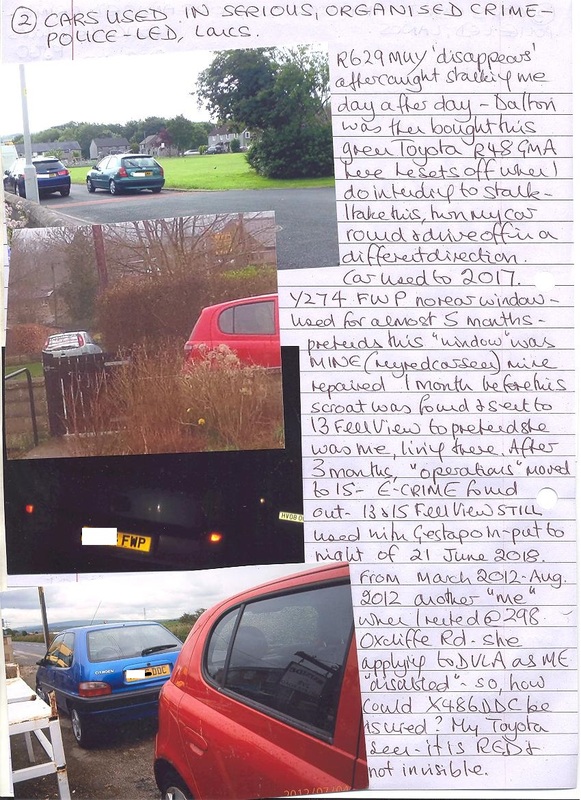 How come one of the seriously criminal neighbours was seen sitting in the missing old lady’s car 2 years after she vanished – the car parked right by Carol’s home with this neighbour sitting in the driving seat? And there’s so many more questions that are refused being answered – such as why is there an illegal tracking device in Carol Woods car? 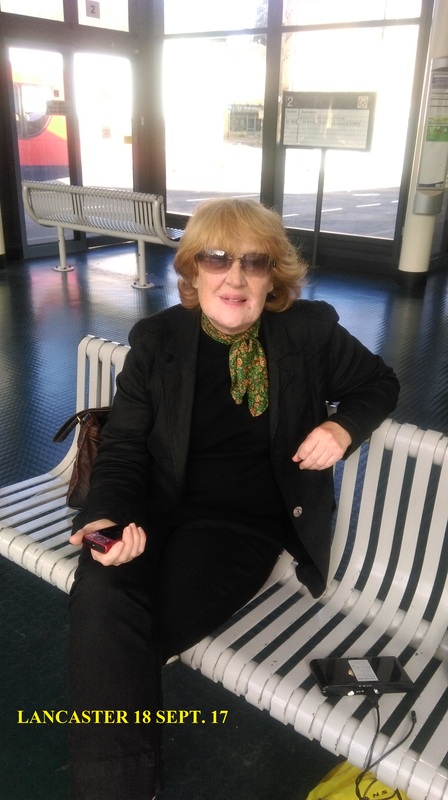 After all, Carol is not a member of any organised crime gang, nor a terrorist, she is a retired Probation Officer, and former Child Protection Officer, and top Social Worker too, yet the GPS tracking device has been installed by Lancs. police in Carol’s car years ago, shrouded in secrecy, with Lancs. police refusing to answer F.O.I.A. 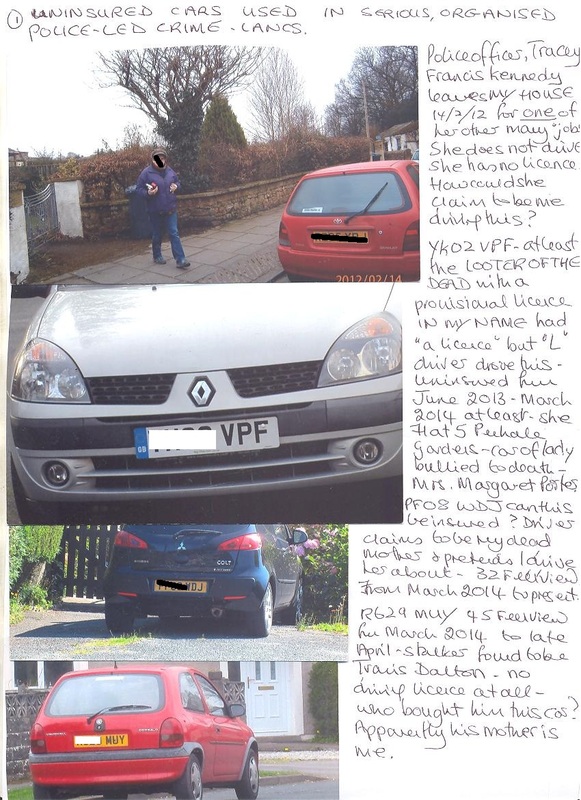 requests, and official complaints too about it – see THE ILLEGAL GPS TRACKING DEVICE IN CAROL WOOD’S CAR – WHY A LANCS. “COVERT POLICE OPERATION”? CAROL WOODS IS NOT A CRIMINAL – 21 April 2018 + archive. More background is below, which includes the UK Column’s 2016 interview presentation video https://www.youtube.com/watch?v=3noOtwoNo4Q along with more presentations that certain entities must surely wish didn’t exist at all. Overall, Carol’s targeting involves scores of characters, many in authorities too, with many used daily even – eg. local yobs who stalk and follow Carol when she’s driving her car, or when she’s at the Lancaster Uni library using a public computer there that the yobs hack via the easily hackable public Wifi the library uses, plus many neighbours living close by Carol are used constantly [as described in scores of updates], not forgetting those numerous persons who comply with their orders from high up – eg. 1] the electricity company [who failed to act during the recent very cold spell when Carol’s electricity was turned off 4 days before the cold spell began with the electricity not reinstated until weeks after the cold spell ended, despite an outrageous number of messages sent to them], 2] different delivery company drivers delivering top quality goods to neighbours constantly – got by [v. strongly alleged] fake ID using Carol’s name, plus 3] the R. Mail postmen’s antics. plus 4] the phone + Internet lines going into Carol’s home [up into her loft], neither used by Carol at all, and so on, yet noone will say or do ANYTHING about ANYTHING, from eg. Lancs. police – I have a stack of letters now from them – see the latest that came today, directly below, and, regarding this letter to do with a FOIA [SAR] request I made that began overall literally MONTHS AGO, please note that often I have sent in letters of permission many times from Carol to be able to interact with this lot, with adequate personal ID, yet even more is needed still! They know only too well who i am, for Pete’s sake, which my stack of letters would prove, and it’s not because of anything other than supporting Carol in her quest for any kind of justice! Carter denies knowing anything about my house THEFT WRECKING and LOOTING of. Cherry Trees Sunnyside Lane Lancaster LA1 5ED. NO CHAIN why if this was seized in the supposed bankruptcy? They have to get the highest bidder BY AUCTION not sale in Masonic estate agent’s. It states “In need of improvement” which is the removal of MY expensive double glazed windows needing to be replaced, the INTERNAL DRILLING of walls, the wrecking of garage and outdoor “buildings” (thugs searching for where I may have hid my files as they were tipped off wrongly by false friend JANET WOODALL of 11 Sullom View Garstang near Preston Lancs.). The photos I have show the STEEL DOOR which says LANCASTER CITY COUNCIL which they claim is made up by me in “delusions” but I thought the stencilled lettering was a clue as to the thugs identified. Then how could PERELES and KENNEDY afford to refurbish MY house? They were given MY COMMISSIONER’s money of £50.000.00 (minus the tax which I paid on the award) for INDUSTRIAL INJURY. (Since then others the Gestapo have claimed to be me have had the same amount as if they were me, the latest is CURWEN thief in 24 Fell View who claims he is married to me and that the money came from an RTA as the liar he is.) I rent 28 Fell View but apparently live in at least 24 other houses all unemployed lowlife and those who do not claim to actually be me, claim I live with them as a relative. Thus CARTER knows nothing? Here it is NEWSPAPER plus added photos and documents for ALL real enquiries. LAND REGISTRY fraudsters WREA GREEN altered my title at least 5 FIVE times via CHERYL KAYE there to constantly rewrite history to aid and abet this FRAUD. Apparently, a mortgagee repossessed my house which was odd as I have never had a mortgage on it. Then it was said that I was “too disabled” to live in and apparently choose to live with unemployed lowlife as strangers instead. WHO SAYS? The Gestapo who murdered MIKE TODD GMP as he found out about the FRAUDS, DEMAND MONEY WITH MENACES etc all related and was prosecuting which was why after March 2008, I then needed to be “silenced”: they have failed to silence me. Police modelled on the Nazis, UK 21st C. Ends Carol Woods Ms. Please feel free to quote me. I sent this in regard to the theft, looting and wrecking of MY house in Oct 08 and Nov 08. The Land Registry docs I can show have been altered 5 FIVE times trying to cover each FRAUD I expose in that. The email to DAVID CARTER one thief involved is ignored; he claims now that he had nothing to do with MY house THEFT and FRAUD yet his name is all over papers and I have photos to show he was at my house claiming he could sell it. But this, police officer TRACEY KENNEDY (she has at least 4 jobs incl being self employed using MY house which she claims to have bought as self employed alternative practitioners) and her partner ANNA JUDITH PERELES sold 29 Blades St Lancaster to buy my house WHICH HAS NEVER BEEN SOLD, in that the FRAUDS using Blades St are proven which may interest you. Kennedy lived in hiding in 29 Blades St from 2007 as she was wanted by various debt agencies and courts (how odd as a police officer!!) but Blades St was used as their “alternative practitioner” business. Yet when Pereles sold it, NO CAPITAL GAINS TAX WAS PAID yet it had been used by Pereles for years (even prior to Kennedy moving in to hide) as self-employed. There is much linked to their frauds and the constant changing of when they sold Blades St and who bought it, I have all the answers. Do ask, yours etc Carol Woods Ms.
Yours etc Carol Woods Ms PS I wonder why no one wanted my title deeds for any “sale”. Then SHIRLEY and DEREK RYCROFT rented flat 4 above me (ground and 1st floor flats only) a pair of seedy thieves and worse, parasites, but they PRETENDED that they were me and tried to sell MY HOUSE end Aug 2013 as being me as “too disabled” to live there, council staff aided that INTENDED FRAUD and local corrupt solicitors and all on film. They scattered when they saw me out with camera. Without going into too much detail, RYCROFT was used even after I left the flat for 28 Fell View in March 2014. Found out and on film, JUNE and KINGLSEY WILLIAMS then “took over” from 30 Fell View who are exactly the same types of bullying thieves etc. I have parked PRE PAID MANY TIMES only in Manchester is it a farce. The token is to suggest I have not pre-paid and left my car so that whatever lunatic notion the Gestapo think up then the “inconvenient fact” of my car parked is overcome. Well, we’ll see about that, I deal with dimwits, the only thing they have going for them is that they are great in number. Pity the IQ does not match. Last evening, they had of course the usual “witnesses” stood about to confirm they saw the taxi and 3 persons alight enter and as I am invisible, they would not see me thus I would be one of the 3 so presumably on holiday with murderous lowlife who have no language except foul and loud. My camera confirms it all, we don’t need dullards as witnesses. This to FRAUD POLICE who know and do precisely nothing possibly covering for officer TRACEY KENNEDY who claims to be me. Dear Sirs, attached are photos of what I refer to in harassment of yesterday or indeed anywhere I am in or out of UK. I am Carol Woods Ms of 28 Fell View LA2 9RP currently out of UK and any time I send out or report anything at all, Lancs Gestapo in masonic inversion lunacy then claim that what I have reported is something that I have “committed”. Thus any time I have tried to lay informations to pursue private prosecutions, for example, I have been arrested for committing the crimes I am left to prosecute alone. The attached are classic other examples. BLUE SHIRTS as 3 THREE yesterday in the entrance to my hotel: who told those thugs where I stayed so they could act their lunatic event, motive to defraud me? I HAVE GIVEN NO-ONE PERMISSION TO PASS ON MY TRAVEL DETAILS. Thus the ‘blue shirts’, sometimes I have a glut of those in white but here is an example, they all either hide in doorways next to where they ILLEGALLY know where I am and shout “Hello” or “Bye” and pretend they have met with me, sometimes they stalk me in areas they ILLEGALLY know where I will be. An ILLEGAL GPS on my car, admittedly so, from 21 Jan 2012 allows for much of this. Today there was one “blue shirt” only waiting for me as I returned the hotel after being out and I took a photo; he was nothing to do with me whatever he thought he was acting out. Leaving this morning, I had had, in 2 places again, two disreputable looking old women and they were supposed to be lookalikes of the same types used in my home area of those sent to be seen where I am as “proof” they are me e.g. J Williams of 30 Fell View LA2 9RP with her dyed white hair, almost orange, trying to make it look like my colour or Jackson in 26 Fell View who tries to sound to wear what I wear as proof she is me when it is her “rota duty” to be me. This is the organised harassment. The cars on photos are mostly uninsured and some bought using tax payers monies for those without a licence. Thus I send out those photos and the “reprisals” follow. The “blue shirts” are sent to this hotel out of UK to pretend in FRAUD. The uninsured cars I was right about because of the inversion now of trying to manufacture “evidence” that I am not insured and don’t have a licence as if I am someone else and not myself. On that arrest I had with me my driving lience and one Met officer seeing that said, “But this is you”,”Who did you think I was?” They had been told I was the invented Mrs Carole Woods yet sent MY DETAILS. But who then are all those said to be me such as J Hall, about 42 years old now, she who was sent to dentist and drug clininc in Nov 2010 to pose as me attending, what about June Williams 30 Fell View with ID as if she is me (on excellent photos) what about Agnes Jackson of 26 Fell View, Margaret Dalton of 45 Fell View and so on? They simply decide to say I am not me but only pose as me! See the police drivel on BOGUS STATIONERY sent to me recently assuming I was stupid. 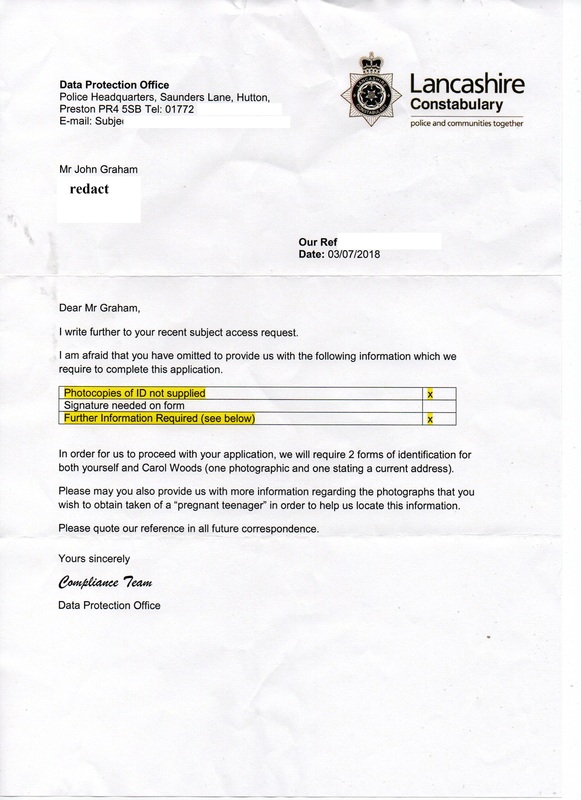 JAMES MARTIN Lancs police, perjurer and more from 2009 and 2010 and he writes to me from “licensing” AFTER I sent out the attached photos; my photos gave them an “idea”. Custody records from ANOTHER arrest (recorded on my dictaphone so we can all be clear) of 31 Jan 2018 which went wrong for them. Thus this drivel is to PRETEND that he writes to me as if it is car licence related; I did not write, I will not ring him as the liar at best he is, they will not create a ” new history”. 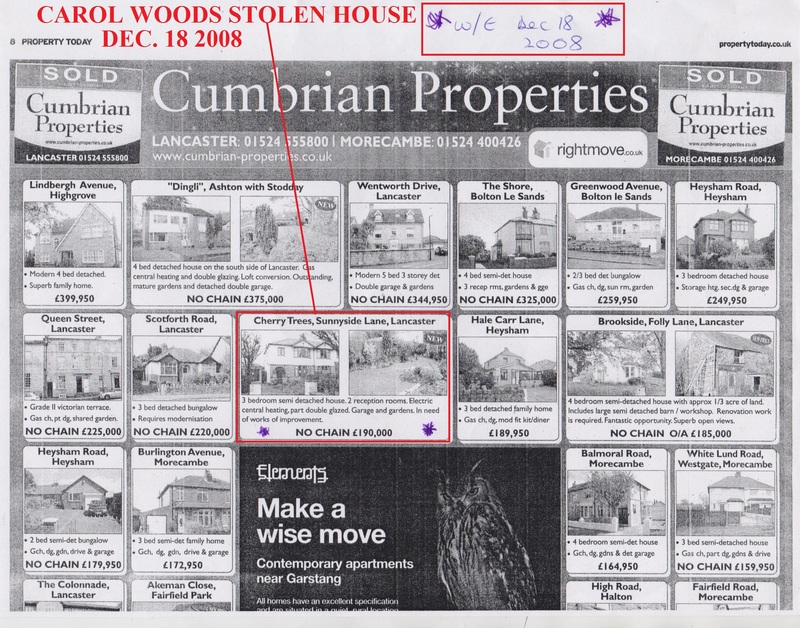 Dear Sirs, WARSAW Consulate, This is part of an ongoing matter for me since 2001 when I blew the whistle on Lancashire County Council and the police for major wrongdoings: without going into all that, the punishment for me was the theft, wrecking and looting of MY house in Oct/Nov 08. In 2010 a manager in London FCO seeing photos and FALSE COURT DOCUMENTS on my house and matters related, told me, with a daughter, that they might have to get me (us) to live abroad as “This is police-led” I said I did not want to live abroad and as they knew who the culprits were then why not deal with them? In Nov 08 I with a daughter (the one that was in London FCO with me July 2010 – I have 3 daughters) and 2 of her hard working, decent friends was arrested for burgling my own house. The police who queried the farce “This is her house” were sent away by PC JIM EDMUNDS who commandeered all related to me as he was corrupt, posed as various ranks and the nephew of an inspector so nepotism was found out. In that I had my bag with me and the contents were listed while I was held (I was held over 14 hours, kept in the dark literally with no food or drink, gross breaches of PACE intended to “break” me) I was not even spoken to: they had no intention of interviewing me. Released without charge (of course) they returned my belongings and handing me my USB listed it as a lighter. No, I told them and showed, a USB and how mad they were finding they could have stolen my data had they not been so stupid. Since then I found they had changed my name by adding an ‘e’ Carol to make Carole, made me Mrs instead of Ms and thus a new person who they INSIST I AM and constantly find lowlife to pretend to be my daughter or whatever is necessary. Nearer to my hotel, I had the usual male troll sending his texts to the next in line AFTER PLANTING A CIGARETTE LIGHTER ON THE PAVEMENT WHERE I HAD TO WALK. That is to be PROOF I smoke and thus am not me but the INVENTED MRS CAROLE WOODS. At my hotel in the car park I had the usual masonic thugs who are used often to HIDE outside where I “live” and they start acting their farces to pretend they have met with me (in lieu of the failed court appearance PLANNED FRAUD) where my signature is forged on whatever drivel they conjur up. This what YOU need to be ‘interested’ in. First I have my passport and was not stopped leaving UK or on entry here as using a forged passport so it is either very good or it is MINE which raises questions then as to who it belongs to if I am not me but the mother of local lowlife and Mrs Carole Woods SMOKER. Dear Sirs I usually use my other email address woodsresearch2002@yahoo.co.uk, but logging into this last evening via the hotel facility, I found an email sent to a blog which is data blogged for me by a supporter and the emailer had found my case via that blog. She had eried to access twitter and forward via YOU TUBE but was prevented, I have also had persons (plural) mention MY FACEBOOK account when they have “trouble” with that; I HAVE NEVER HAD A FACEBOOK ACOUNT AT ALL. IP a pair in 34 Fell View LA2 9RP with “open house” for druggies etc who ALL claim to have links to me; claim I live there and that I am driven about by BLENKINSHIP (long term unemployed with at least 3 vehicles) which is why they do not sign as available for work, they claim to be “carers” OF ME! They are total strangers and have gained hugely in the frauds. She in 34 is called JUNE and uses JUNE F WILLIAMS in 30 Fell View as if she in 30 is me, they PRETEND to be “mother and daughter” to validate the frauds of Blenkinship. Williams in 30 Fell View also claimed (until found out) to be me and that I was her sister and that K MILLS in 20 Fell View with her sister were daughters of Williams making MILLS in 20 seem to be my nieces. The COUNCIL dumped a squalid caravan on the frontage of 20 Fell View and paid MILLS to pretend to drive me about as her “disabled aunt” and paid her carers’ monies, MILLS has gained massively in FRAUD and FORGERY.I could go on but illustrate using just this: that includes 24 TWENTY FOUR all used in the same way which is why 99% do not work round Fell View and adjoining streets. The ‘clever’ loud mouth of yesterday kept quiet and as in Thessaloniki, and Dubrobnik 2017, I found one HIDING in a room as close to mine as possible. It was either 212 or 213 I could not be sure which it was but neither was in use by a guest. A male hid and used his Internet and then tried to sneak out as he heard me leaving: I was not leaving, I was watching to see what the thugs were up to again and found it. * I have been round to see the memorials to the Jews of the 1940’s.Was thugs on my doorstep 27 Oct 2008 “Get out, it’s ours” and then systematic wrecking any different? Maybe there was legal jurisdiction at my house? NO there was not. That is why I refer to the thugs as GESTAPO as the Gestapo acted without legal jurisdiction. I have seen the square dedicated to where household items of the Jews were thrown into the street, why was that any different to Lancaster COUNCIL and thugs looting MY HOUSE? I have photos of where some looted items were stored, a council lock up on Cedar Rd Lancaster. Neighbours have confirmed that my household items (at least 50k worth all rooms on photos for any one who asks) were thrown and some smashed on the pavement and those thugs aiding the council were ATLAS REMOVALS thugs locally to Morecambe and Lancaster who are still sent to stalk, harass and intimidate as I am to “forget” 2008 events especially.The events had gone on for much longer than the 1 year and go on STILL. In among the 4 cars today was sleazy NHS in VW convertible and so, to show those who will see this just how “good” our NHS is I will send out asap the news item which speaks for itself. (The Chief Exec resigns just prior to the report due out on those murdered babies, 11 in all plus at least 1 mother.) I attach the photos of white shirted fraudsters as we had another today, and you may see COUNCIL SLEAZY UNDERWOOD on the photo of 3 stood pretending 1/7/14. They pretended that Mrs Lena CURWEN 24 Fell View “disabled via RTA” as the liar and thief she is was me “too disabled” to live in my house.